Green Bay Montessori Children's World, Inc. was founded in 1963 by a group of concerned parents interested in providing a Montessori pre-school program for their children. We are a non-denomination Christian School providing an affordable, quality, academic program based on the Montessori philosophy. We offer year around programs for children from age six weeks through kindergarten. Please spend some time to learn about our program. Feel free to contact us for more information or to schedule a visit to the school. Our school has been providing quality education for many years. Every year, students with a passion for knowledge take advantage of our specialized programs and courses. For more information, call or come by 670 Main Street in DePere, (920) 983-3164. Green Bay Montessori Children's World is open year around. Our hours of operation are from 6:45 AM to 5:30 PM. We offer age specific Montessori Infant Program (Age 6 weeks to 20 Months), Montessori Toddler Program (Age 20 months to 3 years), Montessori Pre-school Program (Age 3 to 6 years) and Lower Elementary. Green Bay Montessori Children's World Infant program is designed for working parents with children from six weeks to twenty months. The Infant program is designed to duplicate the loving care and gentle stimulation that an infant needs to grow and develop to his or her full potential. Flexible scheduling allows each child to eat, sleep or play at his or her own natural schedule. Our teachers will see to your child's individual needs. A child to teacher ratio of 4 to 1 ensures children are provided with a secure and nuturing environment, filled with love and trust. In following the Montessori Method, we offer a carefully prepared enviornment where children can develop naturally at their own pace. Our infant classroom is designed for safe and stimulating exploration and adheres to the highest standards of cleanliness. Our teachers utilize learning material designed to meet the specific need of your child's current developmental stage. Our infants also receive extensive language exposure through games, songs, confersations and positive talk. The Montessori Toddler Program aims to have the young child develop coordination, body image and awareness, sense of order and concentration. The child enters an environment planned and prepared especially for the twenty month to three-year-old. Materials are designed so even the youngest child experiences success in their work and yet the older or more advanced child will find stimulating work as well. We offer a number of scheduling options in the Montessori toddler program to meet the needs of the children and their families. The full day program (6:45 AM - 5:30 PM) is available two, three, four or five days per week. The half day program (6:45 AM - Noon) is available three, four or five days per week. Activities fall into the following categories: Practical Life, Sensorial, Math, Language, and Movement. Practical life activities aid in the development of the child's independence and mastery of the environment. What may look like meaningless activity to the outside observer is really very important. Each activity helps the child perfect coordination necessary for work at a later date with the more academic materials. The materials aid in increasing the child's concentration and order. The sensorial apparatus helps the child become aware of details. Each material isolates one quality such as color, shape, sound, size, etc. The materials begin with gross differences and work toward finer differences. The Montessori Pre-school program is a five day per week program. We offer a full day program (8:30 AM - 3:30 PM), Morning program (8:30 AM - Noon) and Afternoon program (12:30 PM - 3:30 PM). Optional before and after school care is available to accommodate parent's schedules starting at 6:45 AM and ending at 5:30 PM. AIMS to help the development of reality in the child by helping them discover their relation to the world, nature, people, God; to develop a positive attitude toward others, to present learning as a happy, joyous experience, and to offer an educational environment able to meet the child's need for order and for attaching meaning to their world. STIMULATES development in the following areas: Practical Life, Sensorial, Language, Math, Art Movement, Music, Science, Social Science, Introduction to the Community and Foreign Language (when possible). MONTESSORI EDUCATION is not only a method, but contributes to a philosophy, a way of life. Dr. Maria Montessori believed that no human is educated by another person. They must do it them self or it will never be done. A truly educated individual continues learning long after the hours and years spent in the classroom. They are motivated from within by a natural curiosity and love for knowledge. Dr Montessori felt, therefore, that the goal of early childhood education should not be to fill the child with facts from a pre-selected course of studies by rather to cultivate a natural desire to learn. In the Montessori classroom this objective is approached in two ways: (1) by allowing each child to experience the excitement of learning by their own choice; (2) by helping them perfect all their natural tools for learning, so that their ability will be at a maximum in future learning situations. Dr. Montessori observed the importance of the sensitive periods for early learning, which has been reinforced by modern research. "Sensitive periods" are period of intense fascination for learning a particular characteristic or skill. It is easier for the child to learn a particular skill during the corresponding "sensitive period" than any other time in life. Because the emphasis is on self-learning, and development of an inner discipline, the Montessori teacher has the time and freedom to be able to work individually with all the children in the class. Learning progresses from the basic to the more complex, therefore success for the child in each step of a task is more easily and rationally accomplished. You may find many of the ideas already incorporated in your own philosophy of child rearing. Appreciation of the child's ability to learn and of his individual phase of development, provision for a stimulating environment, respect for the child and fostering a sense of personal dignity, encouraging responsibility and self-discipline. All these are part of the way Montessori can help your child. The pre-school classroom is a prepared learning environment with five areas of interest: Practical Life, Sensorial, Math, Language, and Cultural. The young child learn about the world around them through the use of their senses. Give the child an unfamiliar object ans watch what they do. They will examine it closely, using their sense of sight, touch, tatse, sound and smell. Montessori was aware of this as she designed her materials to educate the senses. Sensorial apparatus help the child become aware of details. Each material isolates one quality such as color, shape, sound, size, etc. The materials begin with gross differences and work toward finer differences. Sensorial materials help the child develop their ability to distinguish and categorize and then connect this new information to what they already know. Proficiency in the sensorial materials give the child a good understanding of the reality around them and a good base on which to build. The math area contains an array of materials that begin with basic numeration to comples mathematical operations such as addition, subtraction, multiplication, division, fractions, etc. Mathematics are presented sequentially and approached on a sensorial level. For example, once a child learns the concept of zero through nine, they are introduced to place values using the "golden bead materials". They can then progress to creating numbers, combining numbers (addition), repetitive addition (multiplication) , subtraction, and repetitive subtraction (division). The language area contains a number of materials such as sand paper letters, object boxes, movable alphabet, phonics and materials to develop small muscle control for writing. The natural progression for language development is first to write. The language area contain materials such as the movable alphabet to aid the child in the process of writing by removing the labor of forming the letters. Most children in our pre-school class will accomplish a first grade reading level by the end of the Kingergarten year. The cultural area includes Science, Geography, History, and Social Studies. There are many manipulative materials in the classroom for the child to explore such things as parts of plants, land forms, maps of the world and continents, parts of animals, cultures of other lands, etc. The materials allow the child to explore cultural subjects as far as as deep as their curiosity takes them. We offer an optional "Summer Camp" for pre-school and elementary students. Students must be enrolled in our pre-school or elementary program to be accepted in our summer camp. Depending on availability, past students may be enrolled in the summer program. In order to accommodate a flexible summer schedule, family vacations, other enrichment programs within the community, parents are provided with the calendar for the summer and select the days they wish to have their child enrolled. Both morning (6:45 AM to Noon) and full day (6:45 AM - 5:30 PM) sessions are available. The summer format includes many outdoor activities, a classroom academic program, daily swim lessons, dance, gymnastics, sports, and physical education. Students are bussed to the Green Bay YMCA for swim, dance, gymnastics, sports, and physical education. 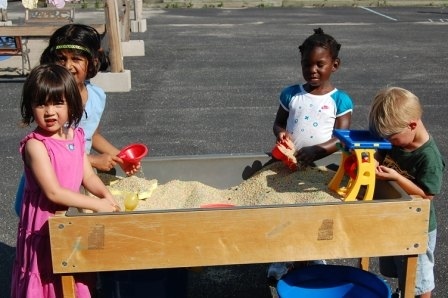 Toddlers have many interesting outdoor activities during the summer session but are not transported to the YMCA.